I have been in the same situation for the last 13 years. What finally did the trick for me, I just decided it was a job, not a lifestyle. I go to work, do my job, get a paycheck and go live my life. It has made all the difference. … detached indifference, simply not giving a damn, might be the best that you can do to survive a workplace that subjects you to relentless humiliation…. Ruth was physically sitting at the table. In her mind, however, she wasn’t attached to her nasty and demeaning colleagues, their opinions didn’t affect her self-worth, their vile expressions and words weren’t touching her soul, and she was in a different and better world. Your situation might not be as extreme. Your coworkers might be more irritating than vile. But the point is that, in order to keep work from bringing you down, you need to build up other parts of your life to boost your immunity against workplace strife. Family, friends, side projects, fitness, whatever is your thing, build it up and make it strong. Otherwise, work will just gnaw at you and make you miserable. And if you give more in an effort to keep assholes at bay, it won’t work. You’ll probably still get laid off anyway or get assigned tasks that you hate, so don’t attach too much value to it. Attach value to what’s really important to you instead of impressing a bunch of assholes. Follow our commenter’s advice: Do your job, get your paycheck and live your life. After all, it is your life, not your boss’s life or your dean’s life. 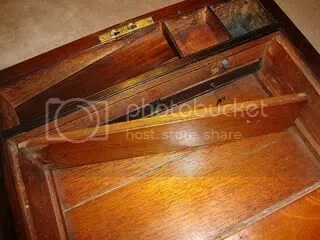 Antique lap desk with hidden compartment. Image by Koppas from Wikimedia Commons, public domain.